“Overburden” is what miners call the stuff that is on top of the coal they want to get at. In Norie Neumark and Maria Miranda’s exhibition CoalFace at the Library Artspace, Overburden is the title of a photograph of a lush Gippsland paddock bordered by towering power lines. The melancholic rage that settles over this word/image mismatch is the key signature for the show that had its beginnings in a month-long residency in Beijing in 2012. The artists’ anxiety over air quality, registered daily on a phone app, resulted in a video showing them on a Beijing street in tight close-up, heads wrapped in fur-lined hoods, faces covered in alarming black filtration masks. Only their eyes are visible and warmly expressive—puzzled, curious, friendly, sometimes fierce—in their invitation to engage and to wonder about the dense smog around them. Back in Australia, they set out in pursuit of Gippsland’s brown coal industry and CoalFace details their increasing fascination with the material itself. Brown coal is beautiful stuff. It is rich, dark, velvety, crumbly and delicious-looking. Video performances show traces of the artists’ process: meditating on the material, its ancient, elemental ‘is-ness,’ the fact of it and its allure, as well as the troubling consequences of digging it out of the ground to power our cities. 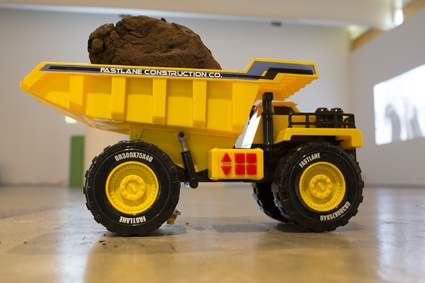 A pile of coal on the floor of the gallery next to a miniature yellow dump truck is much larger than the toy and the poignant disruption of scale points obliquely to the monstrous scope of open-cut mining operations in Gippsland. One video—showing the artists sitting like gods or giant children, pushing the toy truck back and forth between them—also plays with scale in an arresting way. The actual yellow trucks carry 300 tonnes each and Paul Cleary (author of Mine-field The Dark Side of Australia’s Resources Rush, Black Inc 2012) calculates that current plans for the Queensland Adani mine will extract 60 million tonnes a year, equivalent to 200,000 yellow trucks which, if lined up bumper to bumper would stretch 3,000 kilometres. 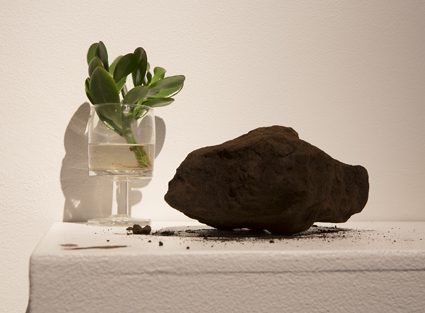 Elsewhere a plinth displays several lumps of brown coal alongside a cutting of a juicy green plant in water that stands in for the prehistoric lepidodendron forests of which the coal is composed. Neumark called this the “petting zoo,” encouraging visitors at the opening to handle the coal and make marks on the gallery wall. Coal’s mark-making capacities are also to the fore in the piece that brings Loy Yang Power Station in South-Eastern Australia and Beijing closest together in After Tan Ping, a series of folded paper hangings on each of which a single line is painted in one stroke from top to bottom, using ink made from the coal. The ancient Chinese painting style and the ancient Australian mineral resource collide: a gesture and a core sample; an aesthetic response to a beguiling material and an urgent environmental question. CoalFace is quietly powerful in its address to the damage caused by the mining, export and use of brown coal, but there is something more complex and tender at its core. It made me feel my human relationship to the earth—the “rich dirt” as Neumark calls it. I came away thinking, almost dreaming, of the dense, dripping temperate rainforests of Gippsland; their slow processes of laying down change; their lush indifference to small-scale, individual humans. Perhaps it is in re-igniting this love (I can’t think of a better word) that CoalFace makes its strongest appeal against the depredations we collective humans are wreaking on our only home/our own/only body.